Yvonne Garcia, left, became a better sales associate after a class gave her confidence. CEO Abigail Kampmann, right, vows employees will grow personally as well as professionally. Being outgoing wasn't natural for Yvonne Garcia, and sometimes she felt intimidated — which can be a problem for someone in retail. 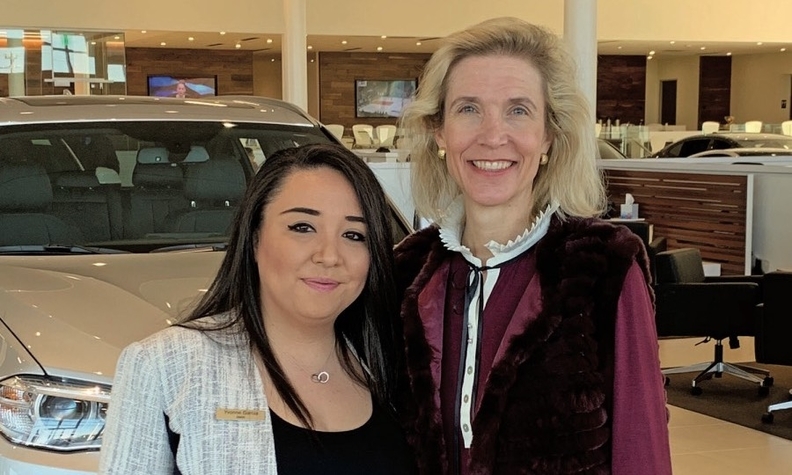 So the sales associate at Principle Auto's BMW of San Antonio took a class — one of many offered through the group's Principle University — in which she had to sing, act, dance and share personal stories in front of her peers. After the course, she sold more than 20 autos each month for a year, making her the company's No. 1 client adviser. She has since been promoted to new-car sales manager. "After taking many of the classes, I can now say I have completely changed from the person I was when I first started seven years ago. These classes have helped me overcome some of my challenges by having me deal with them head-on," Garcia said. "In my new role as manager, my training has allowed me to help my associates gain trust in themselves and push themselves harder in order for us to accomplish something beyond our goals as a team." While companies often have training for new employees or to standardize practices in specific departments, the San Antonio dealership group's Principle University also addresses softer skills such as financial literacy, breathing therapy, how to dress for success and the Dale Carnegie class that got Garcia to open up. "No matter what each associate's experience is when they start a career with us, they will grow personally and professionally while enhancing their desire to take care of our customers by all means possible," said Abigail Kampmann, CEO and co-founder of Principle Auto. "We understand how important it is for our associates to gain and retain effective tools to successfully take care of our customers every day." The fast-growing group has improved sales, profits and retention since starting Principle University in 2015, she said. Overall employee turnover dropped by 12 percentage points since then. The group taught more than 500 classes in 2018 and expects the program to continue growing across its seven store locations in Texas, Mississippi and Tennessee, including classes taught remotely. New employees quickly become aware of Principle University because that's where they go for a mandatory course, offered once a month, called Principle Practices. In addition to learning the company's benefits and policies, they get to meet its leaders, including Kampmann and COO Mark Smith, the other co-founder, to learn the company's history and its guiding principles, Kampmann said. Some classes are specific to a department — sales associates study negotiations, for example — or location and might be taught by an in-house expert. Other times, Principle hires outside teachers, such as those from Dale Carnegie or the SmartTribes Institute. That Mill Valley, Calif., firm taught the sales and leadership teams neuroscience-based techniques, such as mirroring the gestures and vocal styles of dealership guests to better comfort and connect with them. Kampmann said her aim is to provide employees with resources that will promote unlimited opportunities for both professional and personal growth. Garcia, the newly confident sales manager, said it makes a difference. "Abigail always ensures that her associates are knowledgeable, comfortable and supported," she said. "It's a comforting feeling knowing that Principle Auto takes such great care of us." For 2018, Principle Auto averaged 874 sales per month, 302 new car sales and 572 used sales, for a total retail of 10,487--3,619 news and 6,868 used--units sold last year.